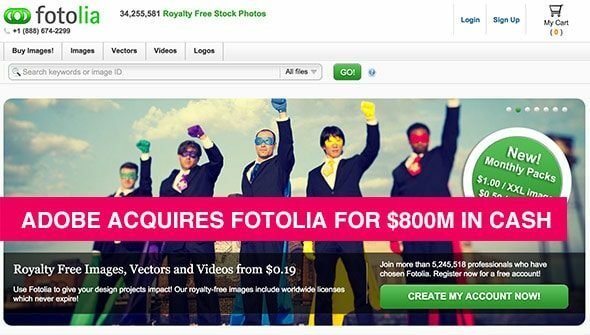 As part of their quarterly earnings announcement, Adobe last night also made public their agreement to acquire Fotolia. For the acquisition, Adobe states it will pay $800 million in cash. Adobe is the global leading software company for creative solutions including Lightroom, Photoshop, Illustrator and Premiere. 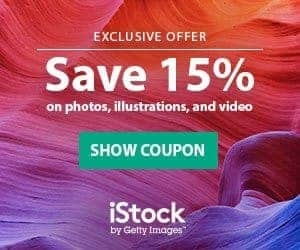 Fotolia is one of the leading micrstock agencies, offering more than 34 million files created and submitted by thousands of creatives from around the globe. We have also covered a contributors view on this acquisition on MyStockphoto. Adobe is in the process of moving from selling boxed software towards a subscription model called Creative Cloud. With the Creative Cloud, subscribers are able to use the different software Adobe provides, such as Illustrator for vector graphics and Premiere for video editing, for a monthly fee. The almost 10 year stock agency founded by Oleg Tscheltzoff, Thibaud Elziere and Patrick Chassany way back in 2005 is one of the top 5 stock agencies worldwide. Along with stock photos, Fotolia is offering an extensive library of more than 34 million files such as vector illustrations and videos. Fotolia also invested into logo creation marketplace Wilogo and audio marketplace Audiomicro. With the agreement, Adobe is said to pay $800 million in cash for the stock agency. This is about one third of the market capitalization of competing agency Shutterstock which is listed at the New York Stock Exchange. Fotolia had received a $150 million financing through American based investment company KKR in 2012. With the usual investment cycles of 3-5 years of investment funds, it was expected for some time how the investment would be capitalized over the next year or two. This deal also mirrors the acquisition of stock design marketplace Creative Market by Autodesk and the raise of $61 Million capital into Pond5 earlier this year. Adobe announced that they expect the acquisition to close in the first quarter of 2015 and plans to integrate the Fotolia offer into the Creative Cloud. There was no specifics on how this is going to happen but as Fotolia already also offers subscriptions for image buyers, it is no hard to come up with the idea of offering a combined solution for software and content. Adobe also had products like Behance offering portfolio pages for artists as well as their creative market place allowing the paid exchange of design elements amongst its subscribers. With Creative Cloud, Adobe says to have running contracts with more than 3 million paying customers. This would open a wide market for the Fotolia offers. While the number of active customers at Fotolia is undisclosed, Shutterstock says it has about one million of active customers. Also, Adobe stated that Fotolia will remain up as a standalone offer and stock agency as it was in the past. Because of major impact of this news, I have decided to create my first (Audio) Interview with stock photo and technology veteran Paul Melcher. 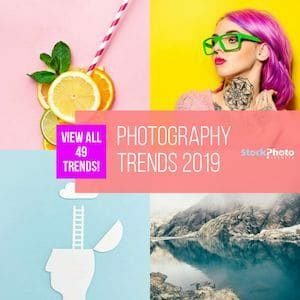 We discuss the impact on the stock photo and Microstock market as well changes which might affect Fotolia's contributors. Or you “watch” the full interview below (or on Youtube). Now tune into the 20min interview and don't forget to tell us your thoughts on the comments below or on Youtube. (NOTE: The video is still uploading, please be patient if it's not loading).